After the success of Star Trek (2009), naturally Michael Giacchino returned as composer for director/friend J.J. Abrams. This installment certain feels like a continuation where we left off with the last film. This story jumps right back into the action of the first film, and its main musical material follows suit. I am trying not to divulge any secrets of the film, but mainly comment on the score itself. Among the themes that get reprises we get his main Star Trek theme, his theme for Spock, and a few references to the original series theme (by Alexander Courage/Gene Roddenberry). The main new theme is for villain John Harrison, a theme which goes through a few transformations within the score. The album begins with Logos/Pranking the Natives and a noble horn solo version of the main Trek theme. It crescendos and blends into an action cue. The strings and percussion play wildly and eventually the strings have a rising motif. The brass enter and play snippets of the secondary Trek theme. With Spock Drops, Kirk Jumps, we get a martial orchestral version of Spock's theme. This track is short, but with plenty of momentum in the low strings. A wordless choir enters for a moment as well. One of the album highlights is Sub Prime Directive. The rising B section of the theme appears (this always reminds me of music from Lost), and a heroic snippet of Alexander Courage's TV theme. A further recap of music from the last film appears - a bombastic version of the theme best heard in "Enterprising Young Men". London Calling begins with a calming piano arpeggio, with Harrison's theme intertwined. The piano works nicely with and against what is on the screen. It gives the scene an almost relaxed, classical mood - something that is opposite of the rest of the album. Meld-merized is a slower moving track, building to the full rendition of Harrison's theme - this time with a sense of purpose and more percussion. The Kronos Wartet starts with another new sound, the vocal chanting of a new theme for the Klingon action sequence. 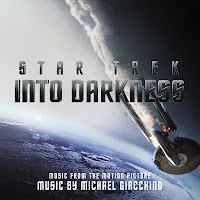 The percussive and low brass heavy music is strong and again unlike anything from the last film (and not reminiscent of Goldsmith's familiar Klingon theme). Eventually the strings take off, with a fast repetitive passage before fading away. With Brigadoom we get a mix of eerie, ethereal music and Harrison's theme, with hidden menace. 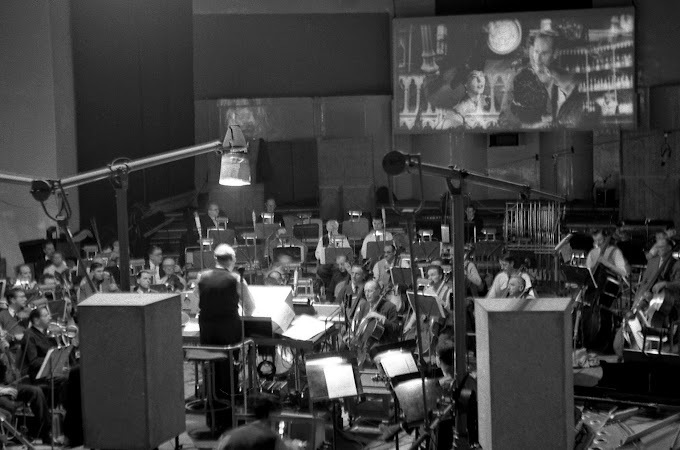 The orchestra bursts in to match the film, before fading away. The momentum picks up in Ship to Ship, which brings an ostinato and hints of the Star Trek theme intertwined with Harrison's theme. Earthbound and Down is another percussive action cue, with the brass and strings adding the dissonance and tension. Warp Core Values has more strong emotions and a Trek theme reference. There are some great sentimental moments with the choir joining in and ends the track well. Another stand out. The emotional weight in the cue is similar to "Labor of Love" from the last film. That sentimental side is featured again in Buying the Space Farm. More moving, this time with a simple piano solo. Based on his experience with the show Lost, Giacchino can hit some great emotional notes with slow moving chords and a piano. The action picks up with glissando strings to the finish. The San Fran Hustle is a big action cue, with a blend of Spock's theme in action form, the Star Trek theme and for those with good ears, a reference to Gerald Fried’s classic fight music seen in the original series episode "Amok Time", re-orchestrated with pounding percussion and blaring brass. Kirk Enterprises features more of Spock's theme, a slower, noble rendition of the Trek theme, and a great version of Courage's TV theme. This is slowly paced versions that other Trek films have benefited from. Star Trek Main Theme is the end credits suite, fairly similar to the previous film, with a blaring Trek theme, re-orchestrated slightly. The notable changes include the great choir and added percussion into the B theme. This grand concert suite is a real treat, of course incomplete without one last TV theme. There are several possible bonus tracks, depending on where your album is from, The Growl being the US track. Compared to the orchestral score, all these various tracks are skip-worthy. At 44 minutes, the relatively short album makes a nice highlight album of the film. There is a slight sound difference with Joel Iwataki as recorder instead of the usual sound of Dan Wallin. The new thematic material and fresh arrangements of the past themes work really well and blend nicely together. Sadly, the concert suite of Harrison's theme (Ode to Harrison) didn't make it on the album. 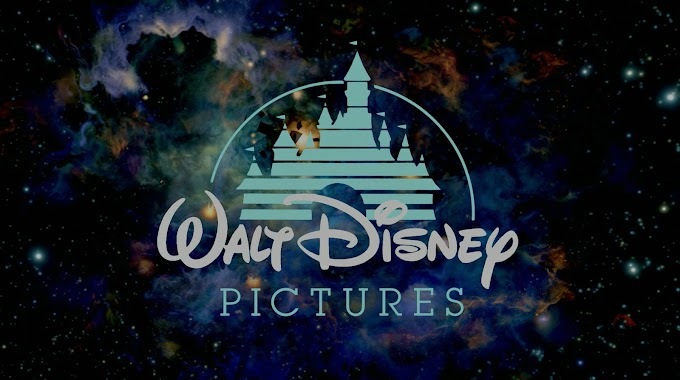 When his new Trek theme appears in the film, it seems as familiar as Goldsmith's main Trek theme from the past films. That stands as a compliment to J.J Abrams and Giacchino. Even while the album is short, the film is full of music - and it echoes the film very nicely. There are some darker moments, quieter moments and bolder/louder moments. Just what to expect! I agree. This is very entertaining score, and just what I was hoping for from Giacchino. I think the album could have squeezed the "Ode to John Harrison" onto it and you would have had the perfect highlights presentation. I'm keeping my fingers crossed that we get an extended release with the "Ode" as well as some of the other interesting (but not vital) material we heard in the film. Does any one know what the suite at played during the credits is called? It is not listed In the soundtrack and I am DYInG to know! Please help.